Hi there! We’re back again with some more photography insights. The most ideal conditions for shooting great photos are as close as possible to sunrise or sunset. As a working mom, this doesn’t always fit the agenda for the day. I hate to miss bedtime and so often have to shoot in less favorable conditions — well worth it! I know that many of us have similarly busy schedules or might be out midday and see something “Instagram” worthy but not quite understand the best way to shoot it. Today, we (Will & I) set ourselves the challenge of sharing our tips and tricks for shooting great photos in harsh conditions, I hope that they are helpful! Tip 1: Find open shade. This is a biggie! It means find as much consistent, even shade as possible. We’re so lucky Charleston’s buildings downtown are high enough to provide a nice amount of shade throughout the day. I find this is the most ideal set-up because the light is even and flattering on skin, or even on the detail of a building — say a window box or pretty shutter. Tip 2: Try to find backlight. I love backlight! I think it adds some dynamic interest to the image. 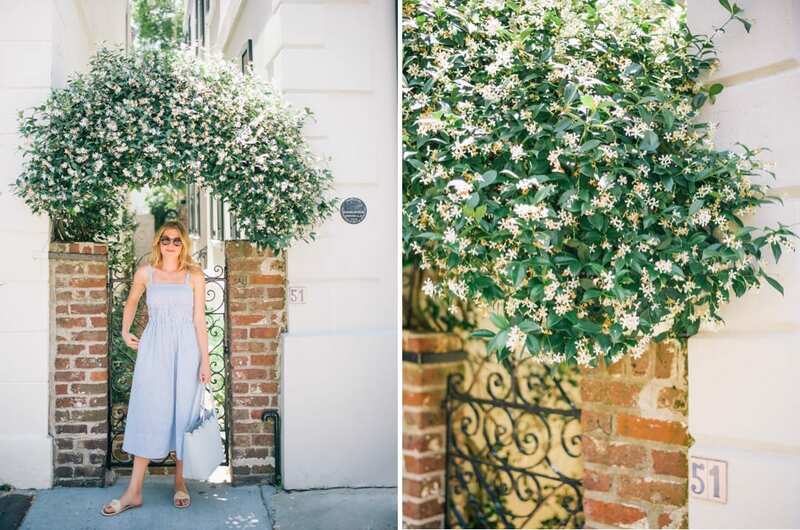 The light coming through the alley way behind the jasmine arch in these images is gentle backlight and super pretty. It lights up the flowers and provides a nice amount of depth to the image which could otherwise fall flat. Tip 3: Find reflected light. The light paint colors of the buildings and the light of the gray of the pavement bounce up into the subject’s eyes and face, this is a great thing as long as it’s not too much. Sometimes if you are standing in the shade and the pavement is very very “hot” (aka bright), too much light can bounce up into the chin making the face distort a bit. You want a nice amount of even light around for ideal conditions. I hope that this is helpful! Please let me know if anything is unclear! We go into a bit more detail here in this video that I made with the amazing Pat Black! Love these tips! Thank you so much for sharing, these are so helpful as I am trying to improve my photography! Thank you so so much for your amazing tips. You’re so lucky to live in Charleston where you have lovely daylight and sun most of the time. But what about living in the Northern hemisphere where it’s really cloudy and dark 80% of the year? You eather have to deal with very dark grey clouds giving you not enough light for beautiful summery pictures or you have those white sky creating a very harsh light. Do you have any tips shooting in that conditions? I would be extremely happy about your help so that my summer outfits don’t look like being shot in the winter anymore :)! Thank you so much! Thanks so much for sharing!!!!!! I live in FL and it’s direct lighting almost ALL day so these tips are very helpful for a girl who loves bright and cheery photos but also wants a non-shadowed photo. Loving the videos! You have a beautiful voice. They are really helpful and not to long! Hey Lucy! How do you curl your hair?